I have been so excited for Dexter’s first Halloween. 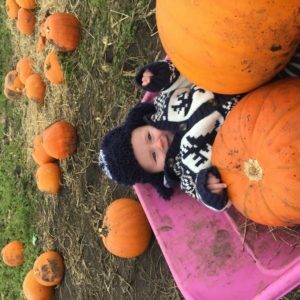 We don’t normally do anything too exciting this time of year but now we have our little pumpkin, we wanted to capture some special memories. 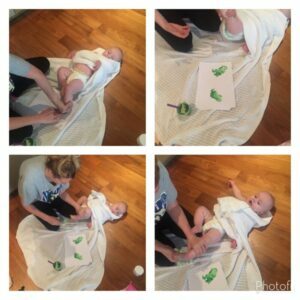 To start, we did some painting.I initially tried to make some edible paint from a recipe I found on Pinterest. Unfortunately it didn’t work out very well. So we got some child safe paint and captured some footprints on paper. I think Dexter enjoyed the experience of being on the floor wondering what on earth mummy and daddy were up to! 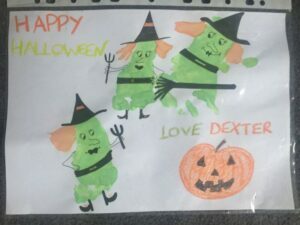 With a bit of help Dexter turned the footprints into witches and created a beautiful piece of art. I have wanted to go pumpkin picking since I saw it on Teen Mom 2. (I was binge watching it in the later stages of my pregnancy) It seems that it is THE thing to do this year. Everybody has been getting in on the act. The first farm we visited was packed out and had hardly any pumpkins left. Luckily we found one in Lydiate which was a lot quieter and we got the pictures we wanted plus a big juicy pumpkin. Once we had picked he perfect pumpkin, we had lots do with it at home. 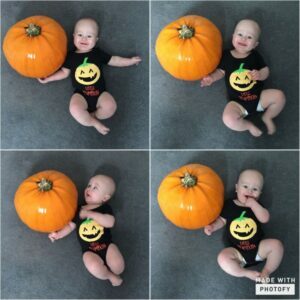 First of we had to capture lots of pictures of Dexter in his new pumpkin vest alongside the pumpkin we picked. We then spent time scooping out the yummy flesh and putting the seeds to one side before carving the pumpkin. 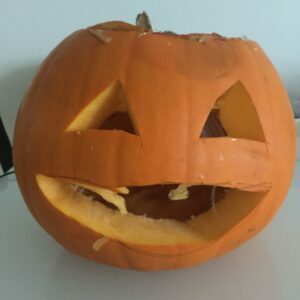 It was my first time carving a pumpkin so it doesn’t look that great! Will definitely try and improve my technique by next year. I boiled the soft pumpkin flesh and decided this would be Dexter’s first taste of ‘solid’ food. 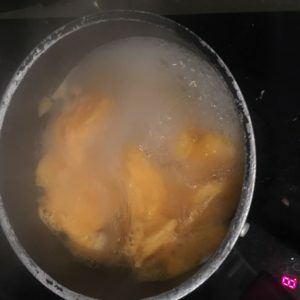 I cooked it until it was soft and blended it into a puree. Also, I toasted the seeds and have kept them to put in my porridge. I love having a seedy porridge in the mornings. 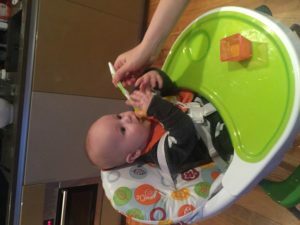 It was quite nerve-wracking giving Dexter solid food for the first time but he loved it and was gesturing for more. By mixing the pumpkin purée with some formula it made it nice and creamy. You can see in the picture below that he’s trying to grab the spoon from me to get it in his mouth quicker. We won’t be going out trick or treating, firstly because live in an apartment block and secondly because Dexter won’t be eating any chocolate or sweets for a long time yet. We won’t have the novelty of trick or treaters at our door either which is a shame. 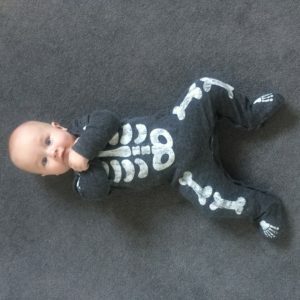 Despite this, I dressed Dexter up in his skeleton onesie that his grandma bought for him. Doesn’t he look cute?